In my five years of living in Paris, I've seen the Christmas season get extended to an almost American extreme. At first, the city seemed to abide by the seemingly forgotten tradition of waiting until after Thanksgiving or rather the arrival of Beaujolais Noveau on the shelves, to start gearing up for Christmas mania, but the Marchés de Noel and street decorations seem like they've already been up for weeks, and so I will follow suit and get into the holiday spirit. This year I am challenging myself to find as many local and ethical gift options as possible for Christmas and I plan on sharing what I find on the blog over the coming weeks. I am excited to visit and share some bonnes Parisian addresses for French based readers, but I'v also found some sources that offer ideas for international, and mostly online, shoppers. 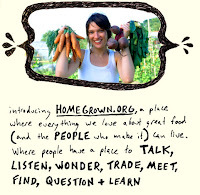 Homegrown.org, an amazing networking site that brings together homesteaders, homegrowers, and homemakers of all sorts, offers their holiday selections which include books on gardening and preserving, recipes for homemade gifts such as soap and candles, and other craft ideas. If you have any trouble making or finding any of the gifts they suggest, or want to find out how to make something on your own, you can join their community for free and get in contact with groups with names like "Resurrect the barter! ", "Urban Gardeners", and "Food Preservation". You can also join my group, "Paris Paysanne". The Huffington Post also published a green gift guide for men this year, which includes 6 gift ideas for under $100. As dudes are often the trickiest people to buy for, this list may be of interest to anyone who doesn't want to cop out and just buy a bottle of booze for the man in their life. Not that there's anything wrong with giving booze as a Christmas gift. 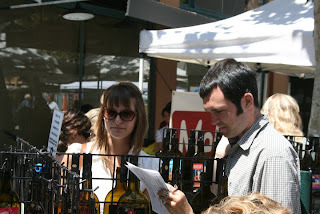 In the same vein, Huff Post's gift guide suggests booze themed gifts, such as recycled wine bottles-turned cheese plates, which I saw last time I visited San Jose's Farmer's Market, and some pretty creative winestoppers made out of old trophies and other recycled objects. Many of the gift ideas included in the Huff Post's gift guide can be found on Etsy which is a great source for gifts in general. As I wrote in an earlier blog post ( see Day 41) many people who are unemployed or struggling within this economic mess have turned to arts and crafts and an artisinal lifestyle in order to make ends meet. I'm sure that many Etsy vendors are hoping that this holiday season will increase their earnings as well as offer the opportunity for them to share their creations with others. this huge organic reusable shopping bag ($12) made from organic cotton, or a 25 piece set of organic oak building blocks ($40) for some good old-fashioned fun. I really love these felt bird ornaments ($35 set of 10) made with felt from recycled plastic bottles. 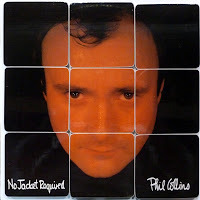 And why not reward the creative genius that resulted in the reuse of Phil Collins album covers in order to produce this amazing coaster set ($35)? The perfect gift for the person that has everything! Don't forget to check out sites like Foodzie and Foodoro, which offer homemade and homegrown food products from small producers all around the world. I mentioned a few interesting products I found on these sites in my Day 41 post, but I encourage you to have a look for yourself and I'm sure you'll find some creative options that could serve as a potluck offering or Secret Santa gift, for example. If you're not into paying for the shipping or window shopping online, check out the preserved foods on sale at your local farmer's market. I really think that good food is the reason for any season, and that sharing quality crafted goods with others is the ultimate expression of how much you value their health and happiness, so with that I wish you all the best during this festive season and, of course, bon appetit.